I love to draw from Master drawings and paintings, and try to do at least one drawing from each gallery or Museum visit. The styles of these artists are so different, that I feel as if each is a challenge for me. These are 4 drawings that I did in the last month - Andrew Wyeth, Henri de Toulouse-Lautrec, Amedeo Modigliani, and Edgar Degas. I was thrilled to see the actual sculpture of Dancer of Fourteen Years by Degas and I've included a photo that I took of this remarkable piece. This is the clay-wax sculpture made by Degas, complete with clothing. She is beautiful! 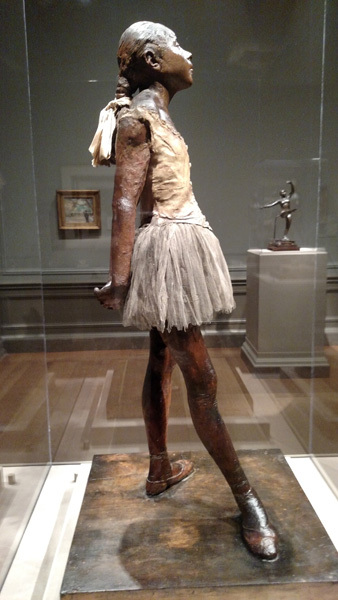 The sculpture was in Degas' studio when he died and more than 30 copies were cast in bronze posthumously, and are owned by museums around the world. Xrays studies show that Degas used old paintbrushes to support the armature within the arms. This wonderful program at the Museum of Modern Art ends today, although the exhibit continues into February. Because I missed regular days over the holidays and while we were in Washington DC, I went to the Studio to "play" on Wednesday, Thursday, and Friday, including the Friday evening party marking the end of the program. 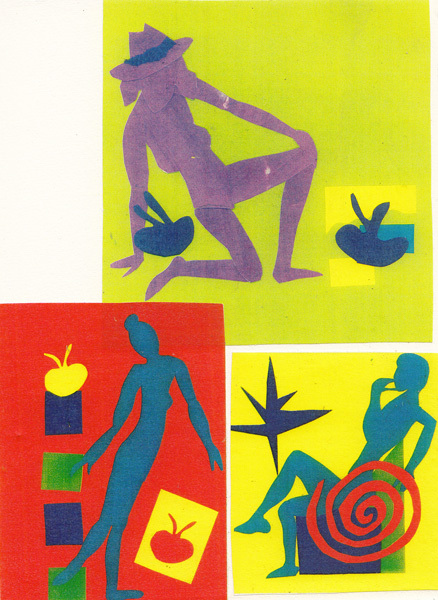 Some of my previous collages, including a fabric collage, already were posted to my blog in Oct, Nov, and Dec.
On Wednesday I started a new series of collages - made by freehand cutting of figures and shapes in solid colors and on a solid background. 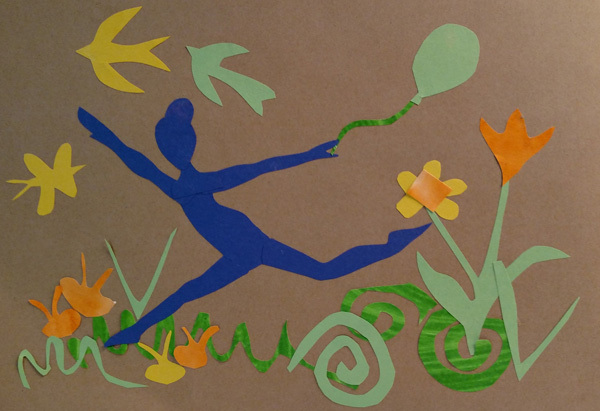 I used some advertisement cards from my ballet studio to select figures in motion, and then just began cutting - making arms, legs, torso, head etc as separate pieces. I loved the experience and my series of 5 collages ended with a bigger piece that was cut freehand and glued during the party in 45 minutes. Here are the collages in the series. The first 5 collages were either copied on a color copier in reduced size at the Studio or scanned and resized digitally at home. The last one was on a large sheet of brown paper given to each of us and had to be photographed and resized. My group of art friends, who regularly met at the Studio, are going to have withdrawal, much like when MoMA Print Studio ended in 2012. 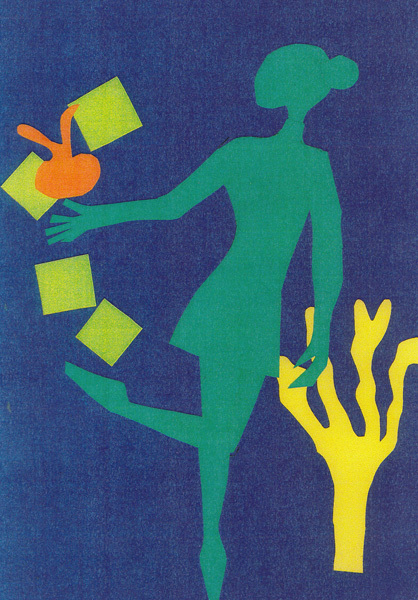 This Matisse program was popular with both adults and children, creating a new, young group of artists who were as enthused and playful as we were. Everyone of us stretched our minds and skills during these sessions and remain forever grateful to the Education Department at MoMA for creating the Studio. Thank you Sarah and Allison and your dedicated studio staff. January 4th is the 9th anniversary of my blog and it is a good time for me to think about how I will spend the next year improving my skills and interacting with artists online art community and locally. Long Term Goals: Develop better drawing and painting skills on paper and with dye-painting and surface design on fabric. Goals for 2015: To sketch and paint everyday, and to blog twice each week These activities give my retirement life some structure and provide enormous inspiration within an artist community. I’m already enrolled in this year’s "Studying Under the Masters" course, but didn’t plan to start it until January. I am registered for two Craftsy Classes one in Drawing and the other Watercolor. I will take the Strathmore Class on Hand Lettering and Calligraphy, but have little interest in the other two this year. I will register for Sketchbook Skool Semester 4 as soon as it is announced. I will register for the Spring Semester at Fashion Institute of Technology, but won’t know which course I will take until registration day in January. 2. Continue to draw and paint locally: I meet regularly with the Central Park Drawing and Art Meet-up group, the NYC-Urban Sketchers Weekday Group, and my good friends Teri, Benedicte, and Pat. I would feel very isolated without them! 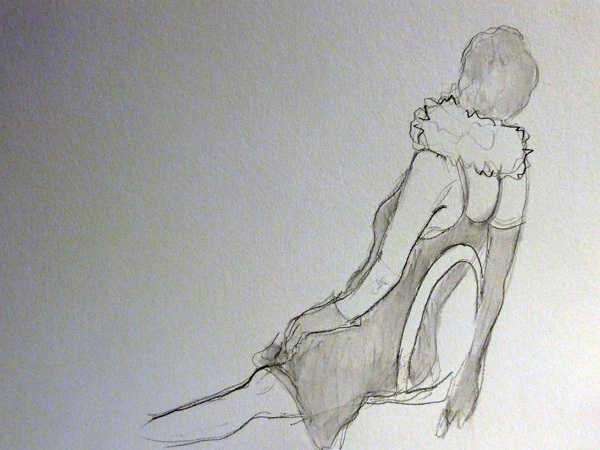 There are multiple drop-in sites for Figure Drawing in NYC and I will attend one of them at least monthly. I will continue to make books - lots of books of different types. I am registered for a Craftsy class on Dye Resists for making new bookcloth for my sketchbooks. I already have used many of the resists on a regular basis, but this class will restart my "dye lab" for 2015. I’m down to my last piece of dyed cloth! I also need to make another batch of paste paper to use for covering bookboards and/or as endpapers. All of these goals are really just a continuation of my goals for the last several years. I love the variety in my schedule and each of these activities brings me enormous pleasure. There will be other opportunities that I haven’t even imagined yet, and I will remain flexible and open to taking small risks! REFLECTIONS ON 2014 - My main goal is: To develop better drawing/painting skills on paper and with dye painting/surface design on fabric. Sketch everyday and blog twice each week: Although I didn’t sketch every day, I probably averaged one drawing per day based on some long drawing sessions. I attend many art exhibits with my friends here in New York City and always draw from the Masters. My blog is really important to me, and my group of online friends helps me remain inspired. I think I only missed my blog goal once in 2014! 2. 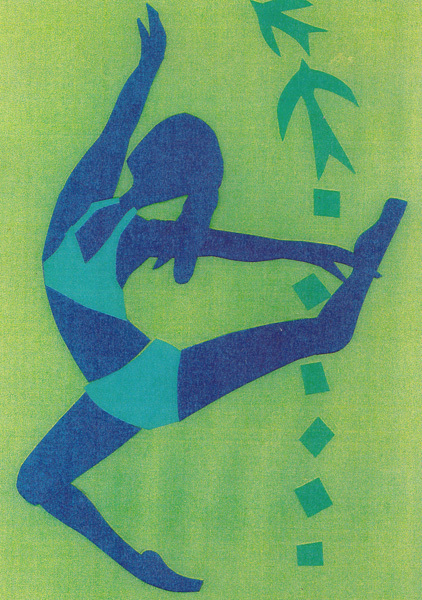 One day Paste-Paper class at Center for Book Arts in NYC; an Artist Transfer Paper Class by Lesley Riley and a Thermofax Screen Printing class at Quilt Festival-Houston. 3. Online classes - as a means to remain inspired and continue to learn on my own schedule, I took 5 online art classes, 1 online surface design class, and 2 online university classes on "Creativity" last year and learned something from everyone of them. 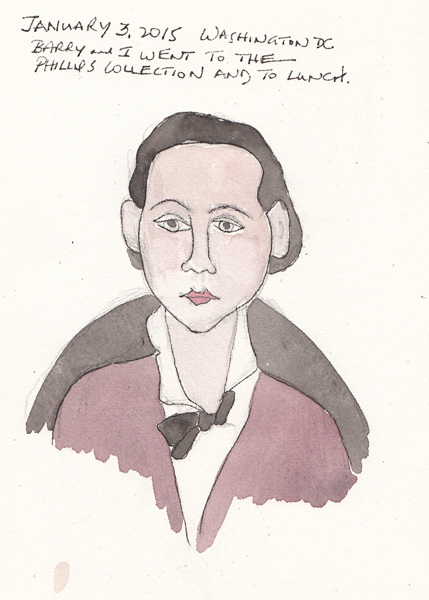 Studying Under the Masters with Jeanne Oliver. Each week I copied a Master Artist painting, usually converting their oil technique to watercolor, and then developed a second painting "inspired by" the specific artist we were studying. There is a category which includes each week of the 8 week course on my blog. I LOVED the challenge of this class! Sketchbook Skool - Danny Gregory and Koosje Koene - Semesters 2 and 3: I chose these semesters of Sketchbook Skool because of the 6 artists that were included and was both inspired and educated by each one of them. I look forward to news about Semester 4! Strathmore Workshop with Gaye Kraeger - My initial sketchbook drawings and paintings were inspired by Gaye in 2005 and led to my awareness of and participation in the Everyday Matters Group several months later. I’d love to spend a week painting with her! Beautiful Watercolor Bouquet - a Craftsy class by Mary Murphy. I did this online class with my painting friend Sara when we were at the beach during the summer. We did lots of Wet-into-Wet painting which I love. The Art of Dying - a Craftsy class by Jane Dunnewold. My first surface design classes were at Southwest Craft Center when Jane was the Chair of the Surface Design section. And I still learn something from her every time I meet up with her - in person or online. My two classes on Creativity were offered free by Coursera, with faculty from Penn State for one and University of MN for the other. I remain interested in this broad topic and learned some skills to increase creativity and innovation from each of them. Learn More Bookbinding Techniques - As a self-taught bookbinder I was thrilled to take a Basic Bookbinding class at FIT during Fall Semester (3 hours/week for 15 weeks), and made 9 different book structures and 2 books that I also wrote or sketched all of the content. This was an amazing experience and can be seen in blog posts within the category "bookbinding" on my blog. Maintain a Community of Artist Friends: Lastly, I look forward to many more art "playdays" with my friends Teri, Pat, and Benedicte and will continue to attend the Central Park and Art Meet-up Group, the weekday New York City chapter of Urban Sketchers, and at least monthly figure drawing sessions at one of several locations. My friends make all of this even more fun. 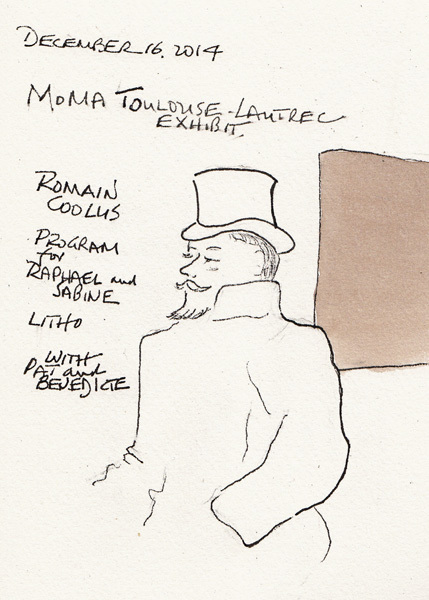 I went back to the Museum of Modern Art Toulouse-Lautrec Drawing Session again this week and these are 3 of the drawings I did. The entire 90 minute session is tightly structured and we move from contour, to blind contour, to gesture, to moving gestures, and then some still poses. 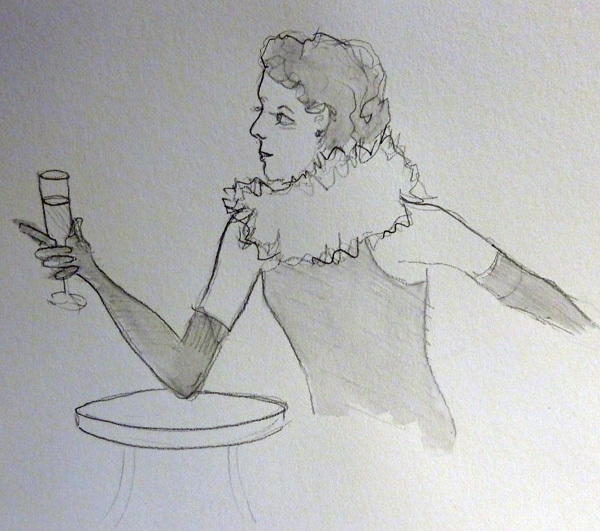 These are poses of about 5 minutes duration - each with some change of props to create a café performer atmosphere. 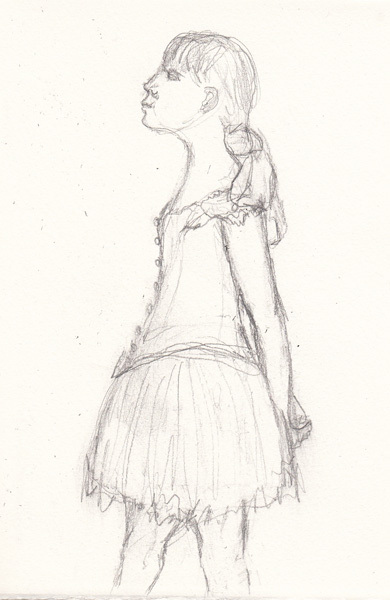 The model is one of the actresses I sketched there before. 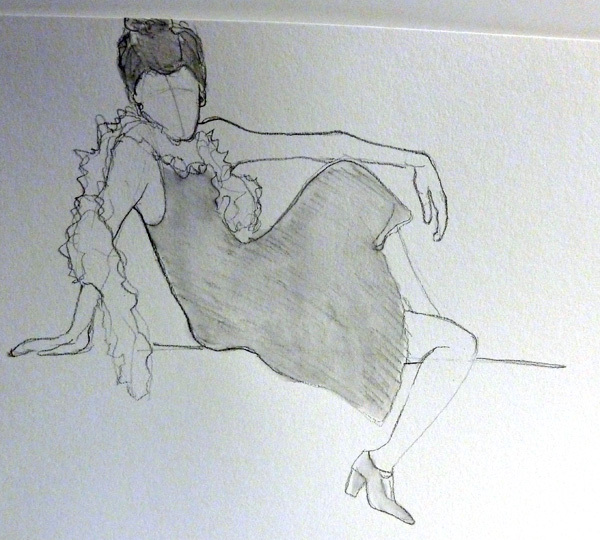 The drawings were done with a soluble graphite pencil and a waterbrush, and then photographed because of size.